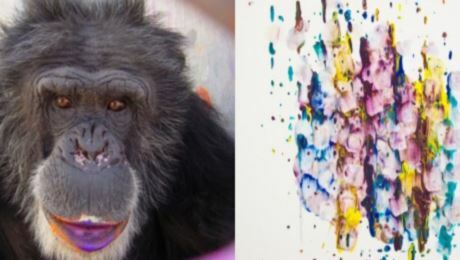 Chimp Brent, who paints with his tongue, has won a $10,000 prize in a chimpanzee art competition in US. Brent, 37, created a delicate, vibrantly colored work featuring daubs of violet, blue and yellow on paper. The entries were judged by noted primate researcher and conservationist, Jane Goodall. The prize in the contest, sponsored by the Humane Society of the US will benefit Chimp Haven, Brent’s sanctuary in Louisiana. Cheetah and Ripley won second and third prizes in the competition that garnered 27,000 votes. Brent is a retired laboratory animal, and the Humane Society says he is protective of an elder companion, named Grandma, and “loves to laugh and play”. “All of the art was beautiful and unique, just like chimpanzees,” Jane Goodall said, in a statement distributed by the Humane Society. Second-place artist Cheetah won a total of $10,000, including a $5,000 judge’s prize awarded by Jane Goodall. He lives at Save the Chimps in Florida. Ripley took $2,500 for the Center for Great Apes, also in Florida. Other artists won $500 grants for their sanctuaries for their participation.